On December 3, 2018, CALS Global Programs welcomed 42 undergraduate students from Brazil, Japan and South Korea through the International Farmers Aid Association (IFAA). Read more . . . This semester-long program allows Global Resource Systems and College of Agriculture and Life Science students to complete academic coursework, including service learning (GLOBE 494A) in Global Resource Systems, while living and learning in Kamuli, Uganda, for the 2019 fall semester. While in Kamuli, students will be enrolled full-time and also have the opportunity to complete on-line ISU courses and in some majors, may complete an internship or independent project. 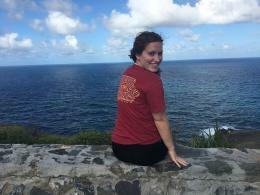 Through the EARTH Program, Iowa State students travel to the U.S. Virgin Islands and the Island of St. John for their summer, spring, or fall semester. While in St. John, students will live, work, and provide community service for the local communities. Students will incorporate their various backgrounds to communicate and contribute in agricultural, horticultural, soil, environmental, food, nutritional, culinary and global resource systems practices to the local communities. Students will gain an understanding of sustainability of human and ecosystem interactions and the contributions of U.S. Virgin Islanders in the culture of the United States. Program directors, Dr. Stephen Dinsmore and Dr. Julie Blanchong from NREM, will lead the travel course to Antarctica though Ushuaia, Tierra Del Fuego, Argentina. The group will spend 12 days on a ship exploring the Weddell Sea, Antarctic Peninsula and the South Shetland Islands. Throughout the duration of the trip, while on the ship and during daily excursions to the continent, expedition leaders and lecture staff will guide students in viewing whales, a huge variety of seabirds, penguins, and seals. Students will explore the icebergs, mountains and waterways of Antarctica's geography. Led by program directors, Dr. Leonor Leandro and Jodi Cornell, this course will enable students to learn about the agriculture, food and culture of Portugal and experience the rich and fascinating history of one of the oldest countries in Europe. Students will tour the country to visit farms, industries and educational institutions where they will have hands-on classes, tours, food tasting, and social interactions with students, researchers , farmers and businessmen. Led by program directors, Dr. Buddhi Lamsal and Dr. Chenxu Yu, the objective of this course is to learn about the production and processing systems and trade barriers for both plant and animal-based foods, practices in food safety and regulation/detection, waste management, and other current issues in China and Thailand. Students will have the opportunity to observe industrial chicken, pork, and rice processing operations of CP Foods, one of the biggest in Thailand. At Dalian Polytechnic University of China, students will visit seafood processing plants and investigate aquaculture practices. In Beijing, students will engage with scientists in the various institutions of the Chinese Academy of Agricultural Sciences, and diplomats and agricultural officials in the US Embassy in Beijing. Apart from academic learning, the group will explore historic and touristic spots and authentic local food around Bangkok and Beijing. CALS Study Abroad Travels . . .Fall 2018! Dr. Leo Timms, Dr. Mary Wiedenhoeft, Dr. Ranga Appuhamy led a group of 22 students to New Zealand November 9-24, 2018, to study the agricultural systems and exportation market economy of New Zealand and also gain an appreciation of the history, culture, and geography of the country and its people. Ten students traveled to Uruguay November 13-23, 2018, under the leadership of Dr. Lee Burras and Bethzayda Matos. This program focused on developing an understanding and appreciation of South America's northern Pampas and the Universidad de la Republica, as well as Uruguay as a nation with a unique and vibrant agricultural culture and economy. “Soils, Agriculture & the Environment of Uruguay" examined the soils, agriculture and environment across Uruguay via a series of visits to farms, forests, rivers and parks. Dr. Gail Nonnecke, Emily Zimmerman and Jennifer Lillo led a service learning program to the U.S. Virgin Islands November 15-24, 2018. The 9 students in this program had an opportunity to work in school gardens, volunteer with the local senior center, help the National Park Service, and aid in food service and distribution at a food bank and meal center. Students also learned about and experienced the beautiful natural resources and rich culture of the U.S. Virgin Islands! Program Directors, Ebby Luvaga and Hector Bombiella Medina, are leading a group of 18 students to Panama during winter break to learn about Panama's strategic location and also experience the Panamanian culture. The group will also learn about how history and culture play a key role in shaping the relationship between Panama, the United States and other countries of the world. Students will gain introduction and first hand exposure to tropical agricultural production, economics, international business, culture and rural life. Dr. Stephen J. Dinsmore, Professor in the Department of Natural Resource Ecology and Management, has been leading study abroad programs since 2006. When did you start leading programs? What programs have you led? Natural History courses to Antarctica (2), Costa Rica (6), Madagascar (1), and Tanzania (1). Why do you lead programs? I really enjoy traveling, and participating in study abroad programs is one way to share that with ISU students. Seeing the reactions of students who have never traveled internationally is especially rewarding. What would you say to faculty that are considering leading a program? Just do it! It can be a lot of work, but every study abroad experience of mine has been incredibly rewarding. And there are lots of resources in CALS to help with the planning and logistics, so that part of a travel course isn’t too much of a burden on faculty. What have you learned by leading programs? I’ve certainly gained a broader perspective on global natural resource challenges through my participation in study abroad. I’ve also learned a lot about myself – how to interact with students in an outdoor setting, better communication skills, etc. What has been your favorite program that you have led? A difficult choice, but probably Antarctica simply because the scenery is breathtaking and it is such a remote area. What has been most memorable about leading a program? Seeing students’ reactions to new ecosystems and wildlife is always rewarding. I have also enjoyed seeing new places that I might not have otherwise visited. Lots of outdoor activities including bird-watching, hiking, photography, fishing, and hunting, and spending time with my family. Is there a place that you would like to lead a program, but haven’t? Churchill, Manitoba (Polar Bears) and the Galapagos Islands immediately come to mind. In a nutshell, it is a life-changing experience for most students. Amanda Gorzney, a sophomore in both Global Resource Systems and Agricultural Communications from Calamus, Iowa participated in her first study abroad program through the CALS Study Abroad Office this past summer in the U.S. Virgin Islands. Her interest in the EARTH Service Learning Program was sparked by her passion to help others and provided her with the opportunity to take a step toward her goals of a global career. During her six week stay, she immersed herself in the culture, learning of the island’s rich heritage that is still present today. Before embarking on the trip, Amanda had not known what to expect from the community, as the group was initially told the locals take a while to open up to visitors. She found this to be somewhat true, but by the end of her stay, she had developed a great relationship with many of the people she worked with every day while making vegetable gardens. Throughout the program, she was reminded of how simple life could be and all of the things we take for granted. “The islands had just been hit with Hurricanes Irma and Maria nine months before our arrival. It was an eye-opening experience to see a community remain so strong and loving after such devastation.” This opportunity has become a major talking point for Amanda, as it stands out on her résumé and pushes her to think outside of the box during classroom discussions. 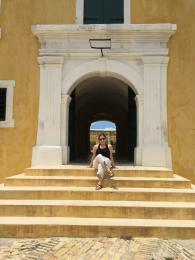 Her advice for students considering studying abroad, “Be open to new experiences and activities. Not everyone comes from the same background as you and you need to respect that.” Along with her travel experience, Amanda is also involved in the International Agriculture Club, Block and Bridle Club, and the Cultural Ambassadors Program. 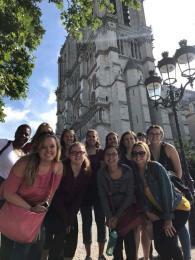 Rachel Crowley, a sophomore in Food Science and Human Nutrition from Cascade, Iowa participated in the Summer 2018 travel course, “Cathedrals, Castles, Culture and Cuisine-sustainable, Safe, & Nutritious Food in France”. Prior to participating in this faculty-led travel course, Rachel had limited domestic and no previous international travel experiences. Rachel learned about the study abroad opportunity while participating in Cyclone Scholars, a program for undergraduate students to develop professional skills in the Department of Food Science and Human Nutrition. Rachel found the travel course program structure to best fit her limited travel experience. 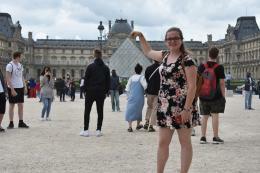 In particular, she enjoyed the pre-departure orientation classes as they helped prepare her for the group’s travel and allowed her to get to know her classmates and enhance her knowledge of France. While abroad, Rachel was able to compare the food storage and preservation methods in France compared to the United States and noticed that there was little food refrigeration and less of a concern about food safety and sanitation when serving or selling foods. On a personal level, she was able to make connections worldwide with upperclassmen, dietetic interns and even businesses on the travel course, allowing her to broaden her horizon about her specific major and learn more about future possibilities in her field of study. Rachel really values the opportunity of being able to travel internationally and the skills learned abroad, she hopes to return someday with friends. Where are CALS Faculty/Staff Traveling? Global Update, a newsletter to keep Iowa State University College of Agriculture and Life Sciences faculty and staff informed of international activities and initiatives, is prepared bi-monthly. To subscribe, send your name, e-mail address and the message "Global Update subscribe" to gap@iastate.edu. To unsubscribe, send "Global Update unsubscribe."